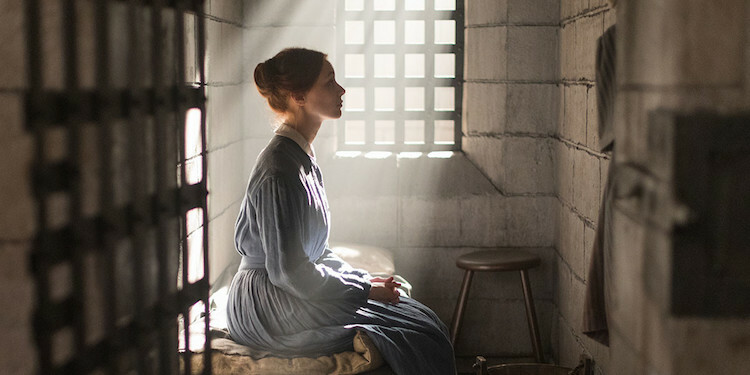 Anna Mazzola reviews Netflix’s new adaptation of Margaret Atwood’s Alias Grace. When she was 17, actor Sarah Polley wrote to Margaret Atwood asking her for the movie rights to Alias Grace. That was pretty ballsy. I also read Alias Grace when I was about 17. I then read it another four times over the following twenty years. At no point did I consider writing to Atwood to demand the movie rights. More fool me. 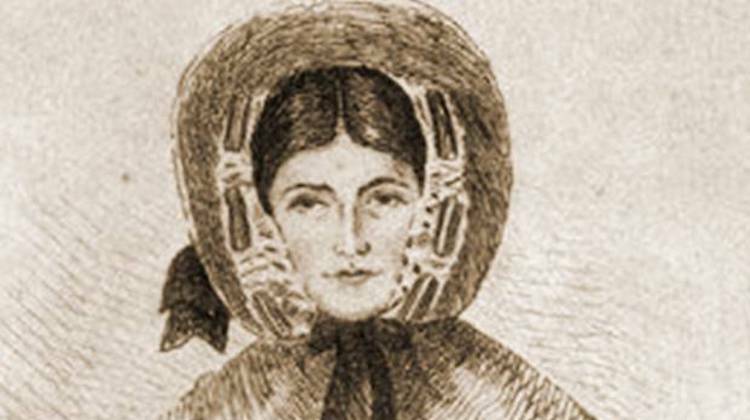 The novel Alias Grace has captured people’s imaginations since it was published in 1996. It’s the product of Atwood’s decades-long fascination with Grace Marks, a Canadian servant who in 1843, when only 16, was convicted with fellow servant James McDermott of murdering their master, Thomas Kinnear, and his housekeeper-lover Nancy Montgomery. Kinnear had been shot in the left side of his chest. Nancy Montgomery was struck in the head with an axe and then strangled. A post mortem revealed that she had been pregnant. McDermott was sentenced to death; Marks to life imprisonment. Before he went to the scaffold, McDermott, a known liar, insisted that Grace was guilty and had strangled Nancy Montgomery herself, using a piece of white cloth. But was that true? Murderess. Murderess. It rustles, like a taffeta skirt. There was fierce debate at the time as to whether Grace really was guilty. She is said to have displayed little emotion during the trial and, according to newspaper reports, arrived at court wearing clothes that she had stolen from the dead Nancy Montgomery. However, many believed she was innocent, the victim of McDermott’s lies and a flawed justice system, and petitioned for her release. Atwood herself changed her view of Grace after realising that her main 19th century source, Susanna Moodie, had fabricated parts of her account of the murders. The novel cleverly maintains ambiguity about Grace, for of course none of us will ever know the truth. I confess to having approached the Netflix version with some trepidation. Alias Grace is my favourite novel. It inspired my own debut novel. I didn’t see how a TV series would capture the subtlety and slipperiness of Atwood’s masterpiece. And of course it doesn’t entirely. It couldn’t. Something sewn so deftly together wouldn’t work as a Netflix series, even one labelled ‘cerebral’. It’s been made into something much more easily comprehensible, more commercial, more conventional. But it’s still a powerful and timely account of female oppression and the subjectivity of truth. 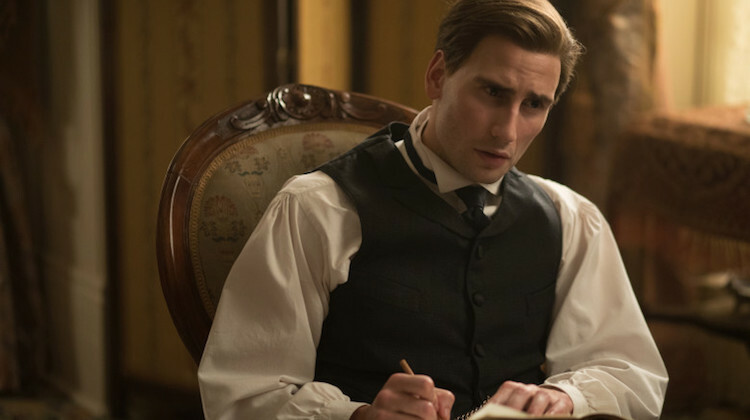 We meet Grace (Sarah Gadon) at Kingston Penitentiary fifteen years after her conviction, stitching together a patchwork quilt as she relates her story to Dr Simon Jordan (Edward Holcroft), who has been appointed by her supporters to carry out a psychiatric evaluation. As she sews, we see episodes from Grace’s past life – her abusive father, the horrific voyage from Ireland to Canada, and her friendship with fellow maid Mary Whitney – ‘Without her, it would have been a different story entirely.’ And all the while she is watching Dr Jordan, enjoying the effect her words have upon him, quietly revelling in her growing power. The production is beautiful, focusing again and again on the pale blue eyes and porcelain skin of its protagonist. The prison scenes were shot on location at Kingston Penitentiary, where Grace Marks really was imprisoned, and the set of the Parkinson’s house, where Grace works as a maid, is decorated by genuine 19th century paintings from the National Gallery of Denmark. 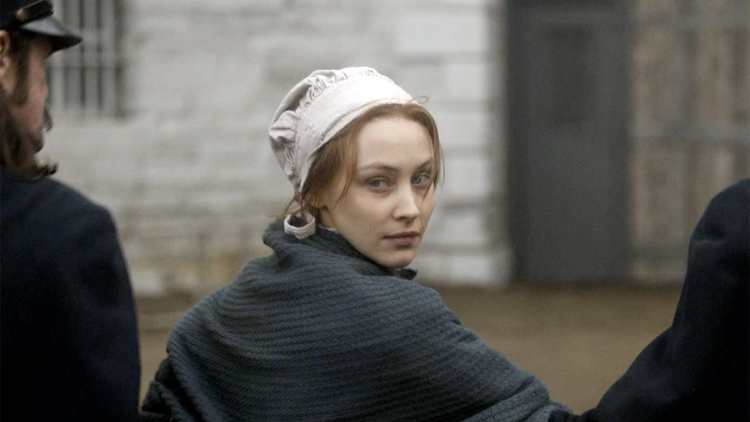 At times (particularly in the scenes of Sarah’s early life) Alias Grace veers into the safe and too-familiar territory of the costume drama. It’s best when it’s gritty, bloody and angry. But then I would think that. I also wanted to see more of Dr Jordan’s life. In the novel, he is much of a character in his own right. However, I’m only two episodes in, and I felt the second was much stronger than the first, with Grace growing more dangerous, more manipulative, more compelling. The glowing reviews the series has received elsewhere suggests that it will keep getting better and better as the story progresses. The strongest thing about this production is its underlying message. Each episode concludes with an a capella version of the folk song Let No Man Steal Your Thyme, a reminder to women to protect themselves: ‘He’ll take what he can find, He’ll take what he can find’. Alias Grace is available on Netflix. Anna Mazzola‘s debut, The Unseeing, is based on the life of Sarah Gale who was convicted in 1837 of aiding and abetting James Greenacre in the Edgware Road murder. The Unseeing is out now in paperback. Read our review. All images © Netflix, except illustration of the real Grace Marks.